Because we were out of the country enjoying island time on Mother’s Day, we planned a belated celebration for my delightful mother-in-law. She’s sleeping over with us tonight before a trip to Maine in the morning. We (and by we, I mean he) planned to cook for his mom and treat this very deserving lady to a homemade gourmet meal. Most unfortunately (and yet, oh so fortunately), without a functioning kitchen we were confined to the grill and crockpot. For this most special of occasions we opted for the grill. And since being home on American ground and acquiring mas dinero, we’ve (I’ve) been thinking nearly nonstop about cooking whole fish and just what I’d like to do with it. I also think a lot about how scrumptious my lil fella looks in a t-shirt and gym shorts and similar plans of action, but, that’s not what this post is about. It’s for his mother, after all. 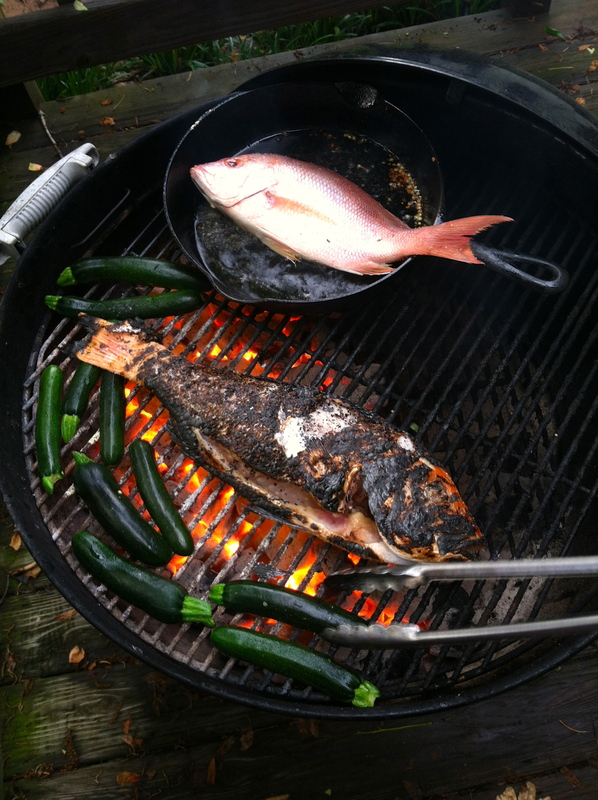 DTH gathered up two whole red snapper, leeks, okra, poblanos and zucchini that my MIL had grown in her garden just a jaunt down the road, and dinner was set. A lil charcoal, a lil lighter fluid, and oh baby, light my fire. Magic happened on that grill, and we all lived to tell about it. If gluttony is wrong, then pumpkins, I don’t want to be right. Good gracious. The perfect Southern summer dinner torched right before my eyes. Topped with an incredible poblano lime puree that he just whipped up on the spot… this a man good with his hands and almost better with his culinary giftedness. Almost. Come for the fish, but stay, open some wine, linger and beg for the poblano lime puree. I would lick this off anything. Yep. Season fish generously with kosher salt. Heat the skillet and oil over the grill coals until hot and then sear the fish in the oil until the fish meat is slightly flaky, and the fins began to pull off. Skin should be golden and crispy. About 15-20 minutes. Slice zucchini in half lengthwise. Lay on grill rack. Cook until zucchini flesh has defined grill marks (4-6 minutes). Remove from grill. Toss with olive oil, salt and black pepper. 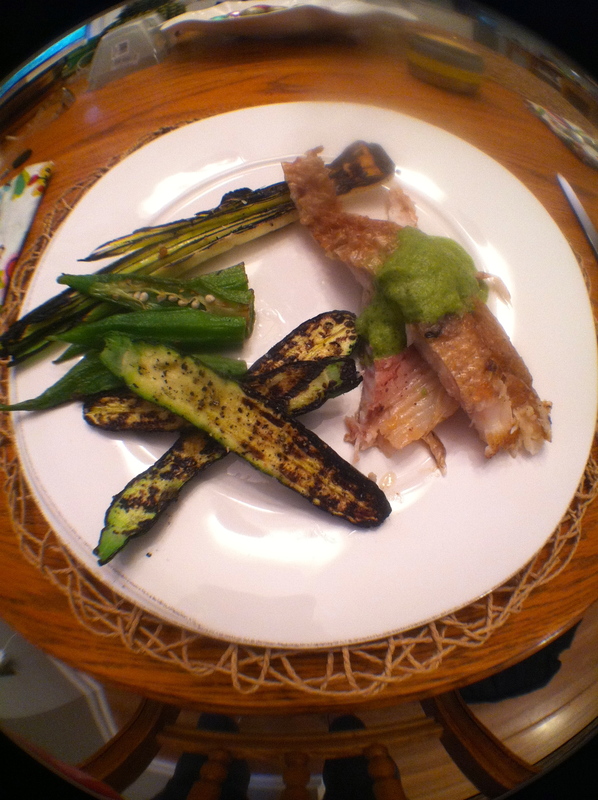 Slice okra in half lengthwise. 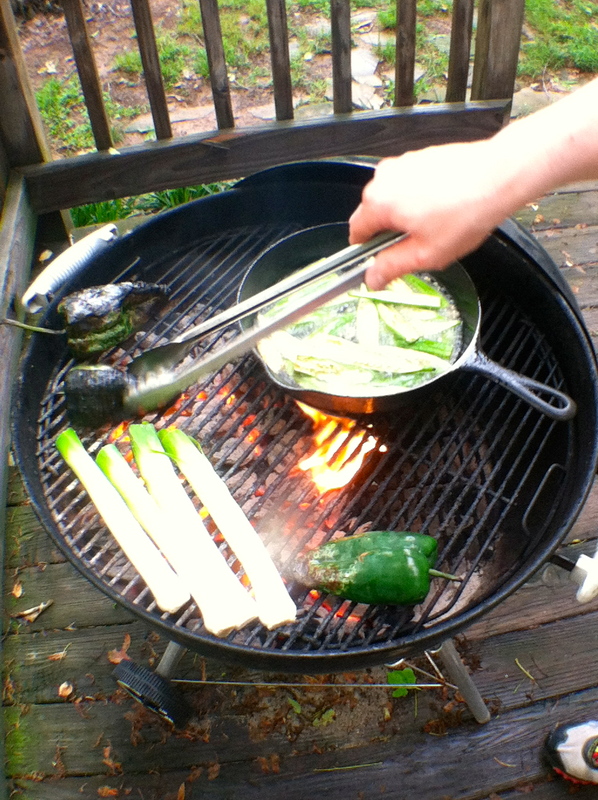 Heat some neutral (vegetable) oil in a cast iron skillet and add the okra to it over grill coals. Let is simmer away and become a succulent joy for the taste buds. Season with just salt and pepper. Always season aggressively!! Slice leeks in half lengthwise. Yet again just add salt and pepper (future blog post) and baste with olive oil. Grill them and add some char to them (my mentor loves char on his food). They are finished once they were soft and limp (yes, I used the word limp) ……Sigh…..
Blister the peppers over the coals until skins are burnt (they will literally look black and blistered). Then clean the charred shins off the peppers, transfer the pepper meat to the blender and add fresh squeezed lime juice (4 limes), cilantro to taste, liberal salt, pepper and champagne vinegar. Puree until soft then add olive oil to make a mock emulsification sauce (essentially add olive oil until the desired texture… think consistency of pesto or thick salad dressing).